Legends, fairy tales, ghost stories and epic adventures have captured our imaginations since people first began storytelling on cave walls. Some stories thrive, while others get washed away. Although storytelling has changed with the times, the digital age still has much to learn from the old traditions. Branding needs to become more genuine, and the winning brands are bringing the human side back through powerful storytelling on both online and offline platforms. Learn new strategies to make your marketing speak with a more authentic voice. 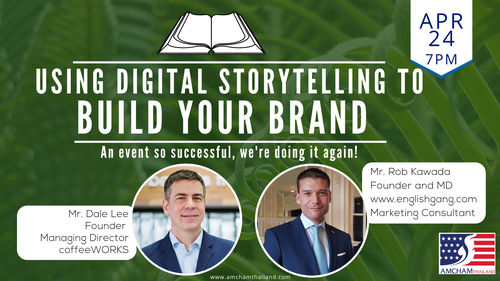 Join us for an enlightening discussion on how the triple bottom line philosophy, a CSR business management practice, and the power of storytelling can help accelerate your brand. Hear firsthand the story of Dale Lee and his business CoffeeWorks, as he seeks to share their triple bottom line story with their customers and key shareholders to help drive sales and build customer loyalty. Learn from noted storyteller, Rob Kawada, as he explains the art and science of storytelling and shares his insights to help CoffeeWorks and other SMEs. Dale Lee co-founded CoffeeWORKS Limited in Bangkok in 1995 and serves as the company’s Managing Director to the present day. With co-founder Andrew Stotz, Dale has steered the company through the initial start-up period and overseen the growth and professional development of the business to become one of the leading B2B fresh coffee roasting and commercial espresso equipment importers-distributors operating in Thailand. Rob Kawada has worked in marketing and tech in Thailand since 2004. "The Science of Storytelling," as he terms it, has been a big factor in his own success as well as the success he has brought to other companies such as MINOR Group, True Corporation, KIS International School, and Fuji Restaurants. He is also the founder of the online English school www.englishgang.com, which currently employs 40 people in the United States and Thailand. Entrance fee includes a 3-course dinner with multiple choices for each course. Special prices for AMCHAM members at the cash bar.